Nestled among the oak, fir and flowered valleys in the heart of the Great Smoky Mountains resides Sequoyah National Golf Club. Owned by the Eastern Band of the Cherokee, this Robert Trent Jones II design offers golfers an idyllic 18 hole journey, filled with scenic vistas, beautiful landscapes and challenging golf – featuring a pro-shop, snack bar, rental clubs (Callaway), lessons, driving range. For more information call 828-497-3000. 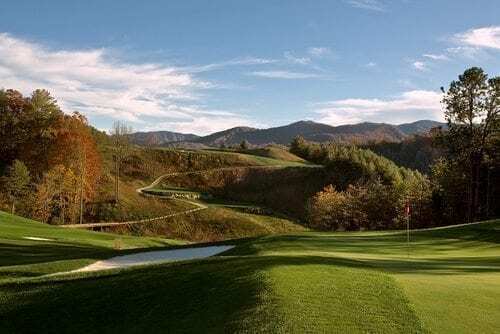 Situated in one of North Carolina’s most dramatic mountain valleys, surrounded by 5,000 foot peaks is Smoky Mountain Country Club, a golf and vacation destination convenient to the recreation and sights of the Great Smoky Mountains National Park. From valley floors to mountaintops, we provide a unique golfing experience at our 18-hole course. Practice facilities include a driving range, putting green and chipping area. Free rental clubs. Open to the public. For more information call 828-497-7622.